« Spoil Yourself Salad Meal! The HN-100 program incorporates and integrates all four of HumanaNatura’s groundbreaking natural health techniques: 1) Natural Eating, 2) Natural Exercise, 3) Natural Living, and 4) Natural Communities. HN-100 introduces and builds lasting fluency with our natural health and fitness system, via a personal fitness regime that you can immediately benefit from and then use to enrich your life and health for years to come. With HN-100, give HumanaNatura about an hour a day and we’ll give you back a naturally fit body, and much more. In the HN-100 program, we will introduce you to HumanaNatura’s new, transformative, lifelong, and lifewide approach to natural health promotion – one that is surprisingly effective, naturally enjoyable, and adaptable to many different lifestyles, settings, and fitness levels. When you have completed the HN-100 program, you will have a basic mastery of the key elements of HumanaNatura’s transformative natural health system, including: 1) daily use of our Natural Eating and Natural Exercise techniques, 2) implementation of your first Natural Life Plan within the HumanaNatura technique of Natural Living, and 3) your initial exploration of the sweeping and health-critical HumanaNatura technique that is Natural Communities. Importantly, you will achieve HN-100’s many important benefits without added costs. The HN-100 Natural Fitness Program is offered free for personal and non-profit use, and requires no special equipment or foods. HN-100 is our way of introducing you to the HumanaNatura natural health system and thereby expanding our worldwide network of practitioners and advocates. With HumanaNatura and HN-100, there never anything to buy and no obligations of any kind. HumanaNatura is a cooperative, not-for-profit organization. Your success at achieving healthy and enduring natural modern life is our mission, focus, and overarching goal. To start the HN-100 Natural Fitness Program, simply review and then begin implementing the 15 weekly sets of activities listed below. In addition , please feel free to Contact Us anytime with questions while you work to achieve progressive natural fitness and quality of life using HN-100 and the HumanaNatura system, now or anytime. Wishing you new health and success as you begin HN-100. With about an hour a day of HumanaNatura guided health promotion activities, expect to experience your own personal health revolution in the next 100 days! 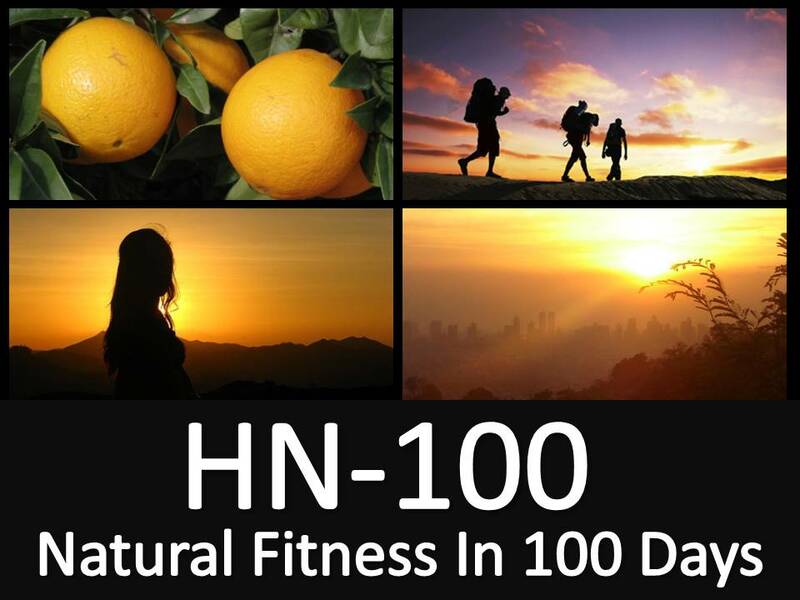 The HN-100 Natural Fitness Program uses a progressive step-by-step approach, with new and ongoing activities each week for 100 days. Whatever your current level of health and fitness, new natural health and vitality are waiting – for you – in HN-100. The sooner you start, the sooner you will see results! If you’ve followed our weekly activities for 100 days, you have now completed HumanaNatura’s HN-100 Natural Fitness Program. Likely, it has been a powerful and challenging time, and perhaps a journey and time of discovery too. At this point, you should be enjoying transformative new natural health, vitality, and well-being. And you are likely in or approaching the best fitness of your life. These changes reflect the revolutionary science and power of sustained modern natural living the HumanaNatura way – even for as little as 100 days. As importantly, we hope you have gained a new and re-naturalized outlook on your life, and on modern life more generally, and can now see the enormous natural potential for ongoing progressive health improvement and human development waiting in our lives and the modern world around us. We hope you will dedicate yourself to your open-ended natural health potential, and encourage others to explore what we each and all might become through a sustained commitment to naturally health-centered modern life. As a next step, we would encourage you to consider HumanaNatura Certification as a means to advance your personal or professional health and quality of life promotion goals. Certification can help you to more deeply explore HumanaNatura and will demonstrate your mastery of our science-based natural health system. Please feel free to contact HumanaNatura anytime – we would enjoy hearing from you and learning about your experiences using HN-100! Copyright HumanaNatura. All rights reserved – please contact us for information on distributing or re-publishing the HN-100 Natural Fitness Program. This entry was posted on July 12, 2012, 13:26 and is filed under Natural Communities, Natural Eating, Natural Exercise, Natural Living, Research & News. You can follow any responses to this entry through RSS 2.0. You can leave a response, or trackback from your own site. Please do, Lucia…all HumanaNatura materials are free for personal and non-profit use. Thanks for your interest!